Will Mississippi State attempt to play keep away against the Aggies? Can Mississippi State slow down the game against A&M, or will they attempt to win a shootout? Arkansas nearly won their SEC opener last weekend by running the ball, milking the clock and not allowing Texas A&M to get into rhythm on offense. The strategy was something the Aggies’ head coach brought up during the SEC teleconference Wednesday. "We’re averaging around 80 (offensive plays a game)," Kevin Sumlin said. "I’ll put it this way, I’ve never had a game where we had 16 plays in a half. I hope it doesn’t happen again." Texas A&M led at the half 10-7 in that game. In order to accomplish this, Mississippi State will have to put up their best rushing performance this season. The Bulldogs are currently 12th in the league in yards per game on the ground with an average of 144 per outing. One area of concern for Mississippi State head coach Dan Mullen is how his team reacts to facing an explosive aerial offense for the first time this season. "A lot of people we’ve played this year have been very run-oriented," Mullen said. "This is really the first, playing Auburn and LSU, the first pass-oriented team that we’re going to face." So far Manny Diaz’s defensive system has resulted in significantly better pass defense numbers for the Bulldogs, but the team has yet to see the caliber of receivers the Aggies currently employ. 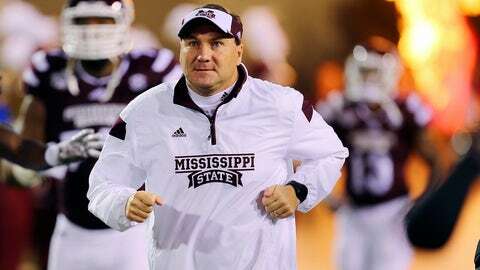 "They’re really athletic on the back end and they have a lot of speed back there and a lot of experience," Mullen said. "For us, that’s one of our strengths, the receiver position with the experience we have there. I think it should be a pretty good matchup"
If Mississippi State tries to get into a track meet with the Aggies, don’t be surprised if the score gets out of hand. While State has the edge at quarterback, few if any defenses have the ability to contain Texas A&M’s gifted receiving corp.